Auguust 17th, 2013, 9:05 PM PDT - We are now 24 hours into the 48 hour Wildcard Qualifier Tournament #2, and I am pleased to report that the tournament leader is... me! At 5:30 PM, I pulled ahead of (tournament organizer) Eric Tessler's top score of 874,100 with an 893,100-point kill screen game. 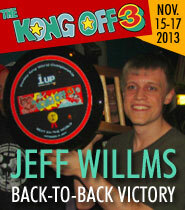 Not quite my personal best, and there is almost no chance that it will hold up for first place since there are still 24 hours left to play and much better players than myself in the field, but the game should nonetheless be good enough to earn me a spot among the 8 online qualifiers for the Wildcard Division at the Kong Off 3. That was my goal for this three-tournament series, so the rest is, as they say, all gravy. I will try to improve my score tomorrow. 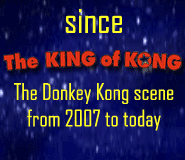 This weekend's tournament is a big one, the biggest ever by Donkey Kong standards, with 72 registered players. 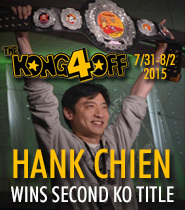 The open tourney includes world record holder Hank Chien, almost-world record holder Vincent Lemay, and, in a major surprise, the reclusive former world champion who was overlooked in the King of Kong—Tim Sczerby himself! The tournament continues through tomorrow at 9:00 PM PDT. To watch the "megastream", click here (usually between 5 and 20 players will be live at any given time). 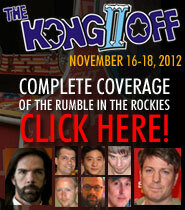 On Sunday, the battle will be joined by the Denver DK Players Guild, who will stream live from the 1up in Denver (Twin Galaxies Headquarters and site of the Kong Off 3). Good luck to everyone for the rest of the tournament. Take me down! Blogging about yourself now, Chris?? J/k, well done!